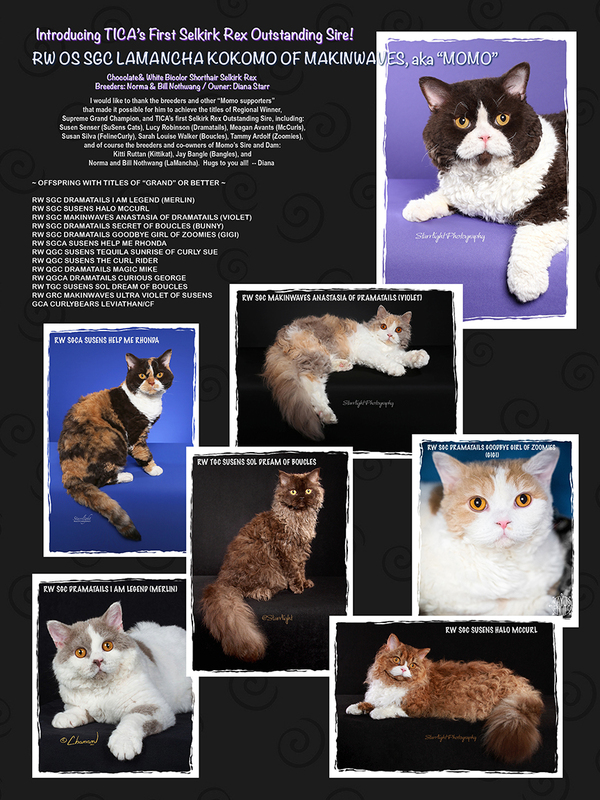 There is a full page ad in the yearbook of The International Cat Association celebrating Momo’s achievement as the first Outstanding Sire Selkirk Rex in TICA. Many thanks to the breeders and supporters to helped along the way! A bit of an update – Baby x Momo kittens! Way behind on news here! Momo and Baby had a really nice litter of six kittens Jan 20. As of today, two are still available. Noodles, a cream tabby and white curly male, and Penne, a calico silver and white straight hair female. Both are *very* outgoing and toy hounds. If interested, use contact page to request more photos and videos. Momo helping Sarah Ruttan with her breed seminar. This judge placed him 2nd best shorthair and 3rd best all breed in championship class. Not sure how many cats overall but that’s good! Momo got a best SH and best AB in champion class from judge David Mare at Crow Canyon CFA show! Thanks again to Susan and Meagan for showing him and giving me the play by play with text and photos.